96-well, deep square-well round bottom plate (E&K Scientific Ritter Riplate). Super Broth (SB: 10 gm 4-Morpholinepropanesulfonic acid (MOPS), 20 gm Bacto Yeast Extract, 30 gm Tryptone Peptone/L). Antibiotic (80 µg/ml final concentration Carbenicillin- for pFLC-I or pBS SK, 80 µg/ml chloramphenicol for pOT2 or pOTB7). Multichannel pipette (Qiagen Multi Electrapette 1550). 96-well semi-skirt PCR plate (E&K Scientific). Deoxynucleotides (Promega, store at -20°C). 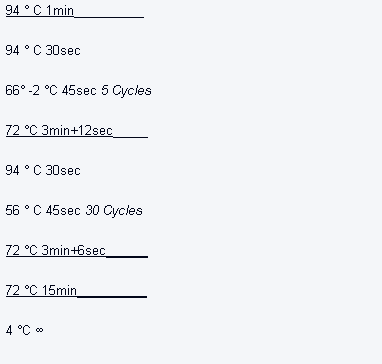 Sequence specific primers ( Invitrogen, store at -20°C). DNA Polymerase (DyNAzyme EXT DNA Polymerase-MJ Research, store at -20°C). Inoculated cells (can be stored for up to 7 days at 4 ° C). GeneAmp PCR System 9700 (Applied Biosystems). Aluminum plate sealers (Polarseal:Foil adhesive Tape for multiwell plates T592100) (E&K Scientific) or 8-strip PCR caps (E&K Scientific). Sephadex ™G-50 Superfine (Amersham Pharmacia Biotech). MultiScreen column loader-45 µl (Milliore) MAHV N45 filter plate (Millipore). MultiScreen Centrifuge Alignment Frame (Millipore). Sterile 0.1% diethyl pyrocarbonate (DEPC, Sigma, handle carefully, toxic) treated H20 (autoclaved). Eppendorf Centrifuge 5810 (equipped with 96-well plate holders). Aluminum plate sealers or 8-strip PCR caps (E&K Scientific). 2X Polymerase mix (2U [T7, T3, Sp6] RNA polymerase (Roche, store at -20°C), 4.6U RNase inhibitor (Amersham Parmacia Biotech), 10mM NTPs (Roche, store at -20°C), 3.5mM digoxigenin-11-UTP (Roche, store at -20°C), 40mM Tris pH 8.0, 6mM MgCl2, 10mM DTT and 2mM spermidine). 0.2 M Tris pH 8 (Dissolve 121.1 gms Tris-base in water, adjust pH with concentrated HCl; pH of Tris is temperature sensitive, sterilize by autoclaving). 10X DNaseI Buffer (0.2 M Tris pH 8, 0.1 M MgCl2. DNaseI mix (1U DNaseI (Amersham Pharmacia Biotech) (RNase-free, store at -20°C), 20 mM Tris pH 8, 10 mM MgCl2,, 10mm DTT). 1 M Dithiothreitol (DTT) (Sigma) (Dissolve 3.09 g of DTT in 20 ml of 0.01 M sodium acetate pH 5.2, sterilize by filtration, aliquot and store at -20°C). Resuspension buffer (50% formamide, 5mM Tris-HCl pH 7.5, 0.5mM EDTA and 0.01% Tween 20). TE pH 7.5 (10 mM Tris-HCl pH 7.5, 1 mM EDTA). Tween 20 (polyoxyethykenesorbitan monolaurate) (Sigma). 300 µl/well 96-well plate (E&K Scientific). Positively charged Nylon membrane (Roche). HybAid Hybridization oven (HybAid Limited). 1X blocking solution (Dissolve 10 g of blocking reagent (Roche) in 0.1M maleic acid, 0.15M NaCl adjust pH to 7.5 with NaOH (solid), store at 4 ° C). Tween 20 (polyoxyethykenesorbitan monolaurate, Sigma). AP Buffer (0.1M NaCl, 0.05M MgCl2, 0.1M Tris pH 9.5, 0.1% Tween 20; prepare fresh before use). Developing solution (Roche, 45 µl NBT and 35 µl BCIP, store at -20°C) per 10 ml of AP Buffer; add NBT/BCIP just before use). Fly Food (1) (3500 ml H2O, 125 g Agar, 125 g Sucrose, 8 g p-Hydroxybenzoic Acid Methyl Ester, 1360 ml Grape Juice, 100 ml 1.25 N NaOH). Yeast (Fleishman) - Mix yeast with H20 to form a thick paste. Three-level sieve (nominal sieve openings (850 µm (20), 250 µm (60), 150µm (100)) (Fisher). Paint brush (Winsor & Newton). 100% sodium hypochlorite (commercial bleach, Kem Tek). GyrotoryÂ¨ shaker Model G2 (New Brunswick). Formaldehyde (Sigma, ACS reagent grade, 25 ml aliquots). PBS (Dissolve 8 g of NaCl, 0.2 g KCl, 0.24 g KH2PO4 and 2.72 g Na2HPO4 ·7H20 in 800 ml of DEPC treated H20, adjust pH to 7.4 with HCl, adjust volume to 1L, sterilize by autoclaving). Master Embryo Mix (see section 3.2.3.1 note 26). RNA Probe (see section 3.1.4). Genetix Q-Fill 2 plate filler. Millipore MAVM 096 01 vacuum manifold. 300µ l/well 96-well plate (E&K Scientific). PBS (Dissolve 8 g of NaCl, 0.2 g KCl, 0.24 g KH2PO4 and 2.72 g Na2HPO4 ·7 H20 in 800 ml of DEPC treated H20, adjust pH to 7.4 with HCl, adjust volume to 1L, sterilize by autoclaving). PBT (0.1% Tween 20 in PBS). 20X SSC (Dissolve 175.3 g NaCl and 88.2 g of Sodium Citrate in 800 ml of DEPC treated H20, adjust pH to 7, adjust volume to 1L, sterilize by autoclaving). Hybridization buffer (50% formamide, 4X SSC, and 0.01% Tween 20, store in the dark at -20 °C). 50% Dextran Sulfate (Dissolve 25 g of dextran sulfate in DEPC H20, adjust volume to 50 ml). Hybridization Buffer with dextran sulfate, (50% formamide, 4X SSC, 5%dextran sulfate and 0.01% Tween 20 store in the dark at -20 °C). Wide opening pipete tips (Rainin). 25 ml reagent reservoir (Matrix). Wash buffer (50% formamide, 2X SSC and 0.01% Tween 20; prepare fresh before use). Goat Serum (Roche, store at -20°C). Anti-Digoxigenin-AP Fab Fragments (store at 4 ° C) (Roche). Developing solution (Roche, 45 µl NBT and 35 µl BCIP, store at -20°C, per 10 ml of AP Buffer; add NBT/BCIP just before use). 70% Glycerol (Sigma, 70:30 Glycerol:PBS, filter sterilize). Aluminum plate sealers (E&K Scientific). Low magnification microscope (Zeiss-Stemi 2000-C). Add 176 µl of 50 mg/ml Carbenicillin to 110 ml of SB and mix thoroughly (2). Add 1.0 ml of Carbenicillin /SB mix into each well of a 96-well Ritter Riplate using a multichannel pipette. Add 10 µl of thawed cells per well using a multichannel pipette (Brand). Seal tightly with Airpore Tape Sheets. Place Ritter Riplate in a 37 ° C shaking incubator set at 300 RPM for 18 hrs. Store at 4 ° C.
Cells are now ready for PCR. Dilute cells 1:100 in sterile deionized H20. For one 96-well PCR prepare a total of 3.19 ml reaction mix (enough for 110 reactions) containing 1X PCR buffer (supplied with DyNAzyme EXT DNA Polymerase-MJ Research), 200 µM dNTPs, 0.3 µM primers and 22 U DNA polymerase. Add 29 µl of the mix to each well using a multichannel pipette. Add 1 µl 1:100 cell dilution into each well using a multichannel pipette, mix thoroughly and centrifuge at 4000 rpm for one minute. Place plate in PCR machine. 6.To monitor the PCR reaction, samples are quantitated and sized by electrophoresis through 1% agarose in TAE (40 mM Tris, 20 mM acetate, 2mM EDTA, pH 8.1) using either the centipede (96 samples) or millipede (192 samples) electrophoresis apparatus (Owl Scientific). 7.The samples are now ready for G-50 purification. Use MultiScreen column loader to measure out the proper amount of G-50 powder. Fit a filter plate snugly on top of the MultiScreen column loader and turn upside down to transfer the powder. 25 µl of PCR product per well plate are ready for transfer. To prepare the G-50 filtration plate, place the already hydrated G-50 plate on top of a 96-well plate with alignment frame fitted on top of it. Centrifuge plates at 910 rpm for 5 min. (This will remove excess water from the G-50 plate). Transfer PCR product into the prepared G-50 filtration plate. Place the G50 filtration plate on top of the labeled 96-well semi-skirt PCR plate. Centrifuge the G50 filtration plate with your product at 910 rpm for 5 min. The samples are now ready for probe preparation. Put 5 µl of 2x polymerase mix into each well of 96-well plate using a multichannel pipette. Add 5 µl of PCR product using a multichannel pipette. 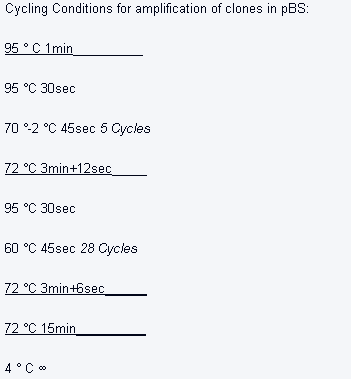 Incubate in a PCR machine at 37 °C for 2 hrs. Add 10 µl of DNase I mix into each well using a multichannel pipette. Incubate in a PCR machine at 37 °C for 15 min. Add 20 µl of 0.2M Na2CO3 pH 10.2 to each well using a multichannel pipette. 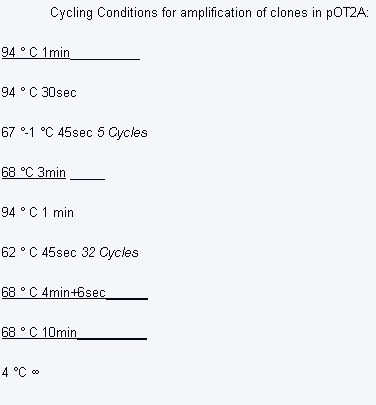 Incubate at 60 °C in a PCR machine for 15 min. Place plate on ice and quickly add 20 µl of 7.5M NH4OAc into each well using a multichannel pipette. Add 160 µl of ethanol, seal well (4), vortex to mix and centrifuge at 4000 rpm for one minute. Incubate at room temperature for 10 min. Centrifuge at 4000 rpm for 30 min at room temperature. Drain by inverting plate 6X, centrifuge at 800 rpm with plate upside down to drain remaining liquid. Quickly resuspend in 50 µl of resuspension buffer (5). Vortex at maximum speed for 25 sec and centrifuge at 4000 rpm for one minute. The RNA probe is now ready to be quantified. Using multichannel pipette spot 1 µl of resuspended RNA probe onto a positively charged nylon membrane (6). Using a multichannel pipette spot 1 µl of controls (7) onto the same nylon membrane. Crosslink in UV Stratalinker (use the autocrosslink function for steps 3 -10 use hybaid hybridization oven and tube). Wash 2X with blocking solution for 5 minutes. Incubate in blocking solution at room temperature for 30 minutes. Incubate in a solution of 1:2000 dilution of Anti-Digoxigenin-AP Fab Fragment in blocking solution at room temperature for 30 minutes. Wash 4X with blocking solution for 15 min. Wash 2X with AP buffer for 5 min. Develop color in the dark (8) with developing solution (9) (about 20 min). Wash 3X in blocking solution to stop the color reaction for 3 min each. Compare the RNA probes with controls (3, 10, 30, 100 and 300 pg) and determine the success rate (10). RNA probe is now ready to be used in hybridization. Place a fresh tray (12) of fly food covered with thin layer of yeast paste (13) into a fly cage. After 3 hrs. (14,15) replace the food tray with a fresh one taking care not to release any flies from the cage. Store food tray with deposited embryos at room temperature for an appropriate amount of time before fixing the embryos (16). Collect embryos from food tray by rinsing the tray with deionized water and capturing the embryos in the three level sieve. The sieving removes fly food and yeast paste (17). Fill reservoir (18) with 100% bleach and shake embryos for 3 min. (19) to remove the chorion membrane. Wash well with distilled water. Remove embryos form the sieve using a spatula and place in a 50ml falcon tube. Fix embryos by gently shaking in 50-50 mix of heptane (20) and 4% formaldehyde/PBS (21) fixative for 25 min. Remove lower aqueous phase and replace with equal volume of methanol. Shake for 1 min then allow embryos to settle. DO NOT VORTEX. Remove upper phase (22) containing the vitelline membranes and embryos remaining at interphase (23). Top off 50ml Falcon tube with methanol. Store embryos at -20 °C25. Embryos are now ready to be hybridized. Prepare a master embryo mix by combining equal amounts of embryos from all six time periods in a 50 ml Falcon tube (26). Use 1ml of embryos from the master mix per 96-well plate and place them in a 15 ml Falcon tube. Rehydrate in 3:1 methanol:2.5% formaldehyde in 1X PBS (27, 28) for 2 min. Rehydrate in 1:3 methanol:2.5% formaldehyde in 1X PBS (29) for 5 min. Post-fix in 2.5% formaldehyde in 1X PBS for 10 min (30). Incubate with shaking at 125 rpm on the GyrotoryÂ¨ shaker for at least 1 hr at room temperature to pre-hybridize embryos. During pre-hybridization put 200 µl of hybridization buffer with dextran sulfate into each well of a 96-well plate using multichannel pipette. Add 2 µl of probe into each well in columns 1-11. Add 2 µl of control probe into wells in column 12. (Use one well in column 12 for a negative control and do not add probe). Mix thoroughly on a vortex mixer at maximum speed for 25 sec and centrifuge at 4000 rpm for one minute. Carefully pour pre-hybridized embryos into a 25 ml reagent reservoir. Add 20 µl of embryos into each well of a 96-well filter plate (using a multichannel pipette with wide opening tips) (32). Transfer the probes from the 96-well plate into the 96-well filter plate and seal the filter plate with an aluminum foil sealer. Incubate at 55 °C with shaking at 125 rpm on the GyrotoryÂ¨ shaker overnight (33). Add 100 µl of room temperature wash buffer. Remove the hybridization-buffer, wash-buffer mix using vacuum; once all the liquid is removed from the wells quickly turn off the vacuum34. Rinse 2x with wash buffer. Incubate in wash buffer at 55 ° C with shaking for 30 min with eight changes. Incubate in wash buffer at 55 °C with shaking overnight. Incubate in PBT at RT with shaking for 30 min; remove PBT. Incubate in PBT, 5% goat serum, 1:2000 dilution Anti-Digoxigenin-AP Fab Fragments at RT with shaking for 2 hrs. Incubate in PBT at RT with shaking 9 X for 10 min each. Rinse 2x with AP buffer. Wash in AP buffer at RT for 5 min; remove AP buffer. Incubate with shaking until desired color development is achieved (about 75 min); remove developing solution by vacuum aspiration. Rinse 3x in PBT to stop the color reaction. Store at 4 °C (35). Check individual wells on the plate under a low power magnification microscope (36). Embryos are ready to be photographed. Add agar into the water and bring to boil while mixing continuously. Wait for agar to go into solution. Add base before adding grape juice. Add remaining ingredients. Mix thoroughly. Use a beaker with handles to pour hot fly food onto the prepared trays. Let the food cool to room temperature before storing at 4 ° C.
For each step prepare enough reaction mix for 110 reactions per plate. Hydrate G-50 plate while running the PCR to save time. Individual wells are very full and if the plate is not properly sealed contamination can occur. It is best to use 8-strip PCR caps rather than aluminum plate sealers to prevent cross-contamination. Resuspension buffer waste must be discarded into properly labeled Formamide waste container. The nylon membranes must not overlay each other to ensure proper contact with the antibody solution. Therefore, if using more than one nylon membrane per tube, the length of individual membrane sheets should be no more that 11 cm. Preparation of Controls. Spot 1 µl of each of 5 dilutions (1:3.3, 1:10, 1:33, 1:100, and 1:330) of several different probes onto DIG Quantification Teststrips. Take the loaded DIG Quantification Teststrips and a DIG Control Teststrip through the quantification procedure. Evaluate which of the probe dilution series best approaches the control teststrip. Prepare an adequate amount of this probe dilution series and store at -80°C for future use. Cover the Hybaid oven door with aluminum foil. Keep the developed nylon membranes in the dark even after stopping the color reaction, otherwise they will turn completely blue over time. Developing solution must be discarded into a properly labeled NBT/BCIP waste container. If the probe spot is at least as intense as the 1:330 control spot the RNA probe reaction was successful and the RNA probe is ready to be used in hybridization. Flies lay better in the dark. Keep the fly cages in a room without windows or cover cages with a light-tight dark cloth. For maximum egg deposition make sure the fly food trays and yeast paste are at room temperature before placing in the fly cage. The paste has to be easily spreadable, so that the fly food will not separate from the tray, but not too watery so that the flies will not stick to the paste. Hybridization assays are conducted usingstaged embryos from 0 to 18 hrs post fertilization. 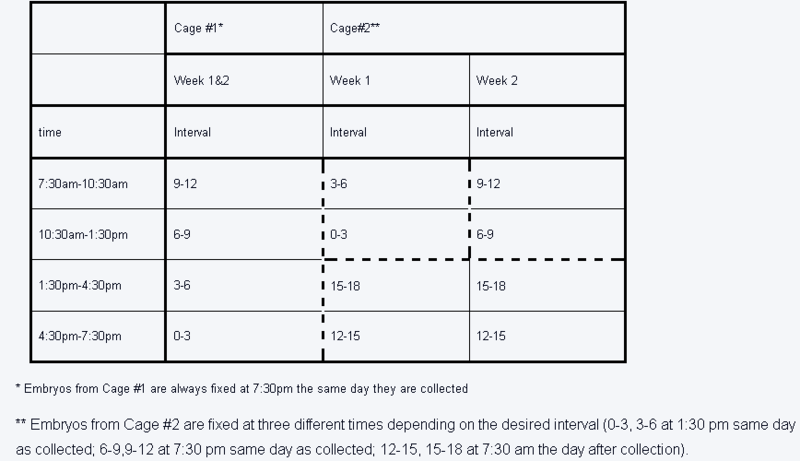 Due to uneven egg deposition during this period, embryos are collected in 3 hr intervals (0-3, 3-6, 6-9, 9-12, 12-15, 15-18) to ensure equal representation of all developmental stages in the master mix made by combining equal amounts of embryos from each 3 hr interval. Carefully remove any flies that may have stuck to the fly food or the yeast paste to prevent further egg deposition. While removing the flies take care not to damage the deposited embryos. 17.Pour enough deionized H20 on the tray to cover the entire area. Use paintbrush to collect the embryos from the tray and carefully pour them into the prepared three level sieve. The first sieve (20) will collect pieces of loose agar, the second sieve(40) will collect loose fly parts (e.g. abdomens, wings and heads) and the third sieve will collect the clean embryos. 18.Must be large enough to contain one level of the sieve and high enough so that the embryos in the sieve are can be submerged in liquid. (e.g. 100% bleach, deionized H20). 19.Timing of this step is critical. If the embryos are left in bleach for too long they will be irreparably damaged. 20.Heptane must be discarded into a properly labeled heptane waste container. 21.Formaldehyde/PBS mixture must be prepared fresh just prior to use. Formaldehyde is a classified as a human carcinogen and should be handled with caution and discarded into a properly labeled Formaldehyde waste container. 22.When removing the upper (heptane) phase, start at the interphase and work your way up. Use Falcon Pipetaid. 23.Good embryos, unbroken embryos devoid of chorion and vitelline membranes, will sink to the bottom. Embryos remaining at interphase are damaged and should not be used in hybridization. 24.Methanol must be discarded into a properly labeled methanol waste container. 25.Do not put more than 7 ml of embryos in a 50 ml falcon tube. Lay the falcon tube on its side to prevent crushing the embryos. 26.The embryo master mix is created by combining equal volumes of embryos of all collected stages. It is best to measure out the individual stages in an eppendorf tube and then transfer individual time intervals into a prepared falcon tube. Let the embryos settle to ensure equal volumes. Easiest way to transfer the embryos is by turning the eppendorf tube upside down above the falcon tube and washing out the embryos with methanol using the pipetaid. 27.Waste from steps 3,4 and 5 of the hybridization protocol (3.2.3) must be discarded into a properly labeled Formaldehyde waste container. 28.Use 12ml total (9ml methanol, 2.88ml PBS, 120ul formaldehyde)-prepare fresh just before starting the hybridization steps. 29.Use 12ml total (3ml methanol, 8.64ml PBS, 360ul formaldehyde)- prepare fresh just before starting the hybridization steps. 30.Use 12ml total (11.52ml PBS, 480ul formaldehyde)- prepare fresh just before starting the hybridization steps. 31.Hybridization buffer with and without dextran sulfate and wash buffer must be discarded into a properly labeled Formamide waste container. 32.Even though there is no way to add exactly the same amount of embryos into each well, care needs to be taken to get as close as possible. If the difference in the numbers of embryos between individual wells is too large, the wells with fewer embryos will drain more quickly than the wells with greater numbers of embryos. The embryos in the wells with fewer number will get flattened and stick together. As a result, the morphology of these will be compromised. 33.For steps 15-31 use the Q-Fill to fill the filter plates (except in steps 22&27, for these use the Electrapette 1550) and use the vacuum manifold to remove the liquid. All volumes are 200 µl per well unless otherwise specified. 34.Set the vacuum on the lowest setting to prevent embryos from getting flattened, crushed or stuck to the membrane. 35.Seal the top of the plate with an aluminum plate sealer using the speedball roller. Then carefully seal the bottom of the plate with another aluminum plate sealer. Place the roller on the bench upside down and slide the bottom of the place on in it until a good seal is formed. This is to prevent the glycerol from leaking out of the filter plate. 36.Check individual wells to make sure that the embryos on the plate as a whole are of high quality--that the controls worked properly, that the hybridization signal quality is high (no or minimal background) and that the embryo morphology is good (e.g. embryos are not broken, flattened nor squashed).